Aside from scouring various and sundry bins at used vinyl fairs (with a fat bankroll) Top Drawer’s “Song Of A Sinner” can most readily be found on a compilation Now-Again Records released last year entitled Forge Your Own Chains. Like Obsession, another favorite compilation that deals in rare, globe-spanning, psych gems, here, Egon and the the Now-Again team have put together a collection that defies both genre and borders. 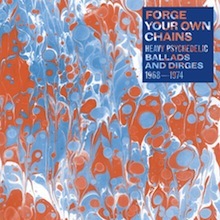 Subtitled Psychedelic Ballads and Dirges, the comp spans 1968-1974 and is an excellent look into the non-commercial “psychedelic” sounds of the era that had little to nothing to do with the so called Summer of Love or other media-concocted movements. Highly recommended. This track was also featured on the mixtape Turquoise Wisdom laid down for us earlier in the year that is a must-hear if Top Drawer at all stoked your interest. So better than nothing? Not sure but at least it provides a small peak into Top Drawer. Thanks again for introducing and supporting such amazing music. Wow. This is a heavy track for sure. Love the vibe though. Makes you want to get right in there and enjoy the psychedelia!